Looking for a super laid-back Florida beach with white-sugar sands and a vibe that's as kid-friendly as can be? In southwest Florida, with Sanibel and Captiva islands to the northwest and upscale Naples to the south, you'll find down-to-earth Fort Myers Beach. Located on a skinny barrier island in the Gulf of Mexico, Fort Myers Beach has more than 30 beach access points, making it easy to find a great spot. Got young kids? Here's our round-up of 10 fun things to do with kids in Fort Myers. If you and the kids would like to try a little fishing without much planning or even a fishing license, then the pier at Fort Myers Beach is the place to go. Everything you need is right there on the pier, and no license is required. If you need to rent a rod and reel, Rudy's Treasure Chest can rent one for around $10 per day, as of 2018. Rudy's also has snacks, ice cream, bait, and water toys available. 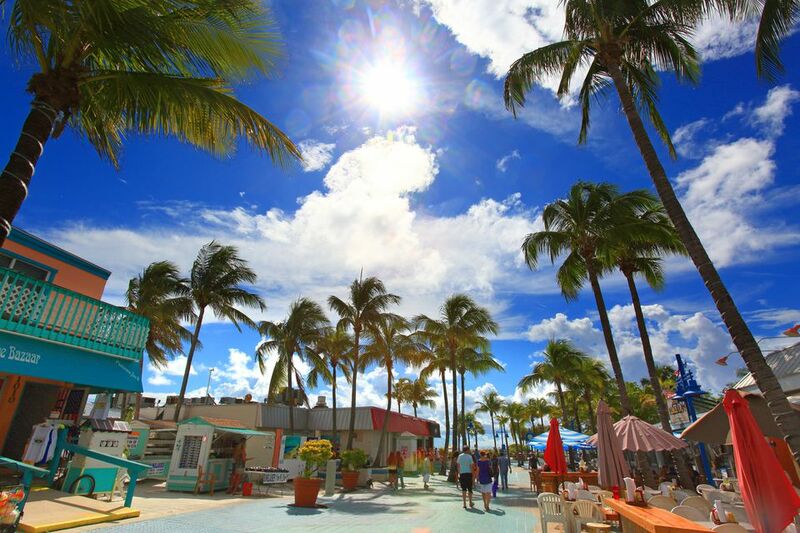 A far cry from its neon-lit namesake in New York City, this palm-studded pedestrian area known as Times Square is considered the epicenter of Fort Myers Beach. You'll find open-air restaurants, cute shops, and street performers here, and it's a great place to grab a meal and hang out. Try Pete's Time-Out for an old-school, al fresco meal, or Fresh Catch Bistro for sizzling steaks and locally-caught seafood. At the Imaginarium Hands-On Museum and Aquarium, families can get their science fix, thanks to an array of interactive exhibits that offer hands-on opportunities to dig for dinosaur fossils or feel what it's like to be caught in a hurricane. The Animal Lab gives you an up-close look at critters such as alligators, iguanas, pythons, prairie dogs, and tree frogs, while the aquarium includes not only tanks of fish and eels but a Sea-to-See Touch Tank that lets kids pet stingrays, urchins, and starfish. Located on Fort Myers Beach's main drag between Mango Street and Fairweather Lane, Royal Scoop offers dozens of flavors of creamy ice cream made in nearby Bonita Springs. With sundaes, banana splits, and milkshakes, there is something for everyone craving a sweet, cool treat. Fort Myers Beach offers terrific shelling, particularly on the southern half of the island. Start on the beach side of Strandview Avenue (across from the Publix grocery store) and begin walking south along the beach. The Bailey-Matthews National Shell Museum in Sanibel also offers guided beach walk, with experts who can help you identify your discoveries. Note that Florida state laws prohibit collecting live creatures, which include live shells, sand dollars, and starfish. Billed as the best mini golf course in Southwest Florida, the medieval-themed Castle Golf course is lushly landscaped and complete with dragons, knights in shining armor, rope bridges, fog machines, gallows, and water features. Located on the mainland in Fort Myers, this course is challenging and very fun. Fascinated by the local sea life? The non-profit Ostego Bay Marine Science Center teaches families about the unique ecology of the barrier islands and estuary ecosystem. You'll learn about dolphins, manatees, and sharks, and there are touch tanks and exhibits for smaller creatures. Catch a Ball Game at "Fenway South"
During Florida's Cactus League spring training season, head to JetBlue Park (also known as "Fenway South"), the spring home of the Boston Red Sox, where you can see the boys of summer play pre-season ball. A number of the characteristics of the ballpark are taken from Fenway Park, including a "Green Monster" and a manual scoreboard. Love trains? The Lakes Park & Gulf Railroad is a 1/8th-scale railroad that travels through the north end of the Lakes Park past villages, towns, bridges, and tunnels. Afterward, take time to explore the 3,200-square-foot Railroad Museum of South Florida, which features model railroads, old photographs, and artifacts from Florida's railroads. Want to ditch the car and get around on two wheels? You can rent scooters, electric bikes, and good old traditional beach cruiser bikes. Fort Myers Beach is easily bikeable; you can start the tip of the island, near Bowditch Point Park, and ride all the way down Estero Boulevard to the Lovers Key State Recreation Area.